Photo: Schomburg Center for Research in Black Culture, Jean Blackwell Hutson Research and Reference Division, The New York Public Library. 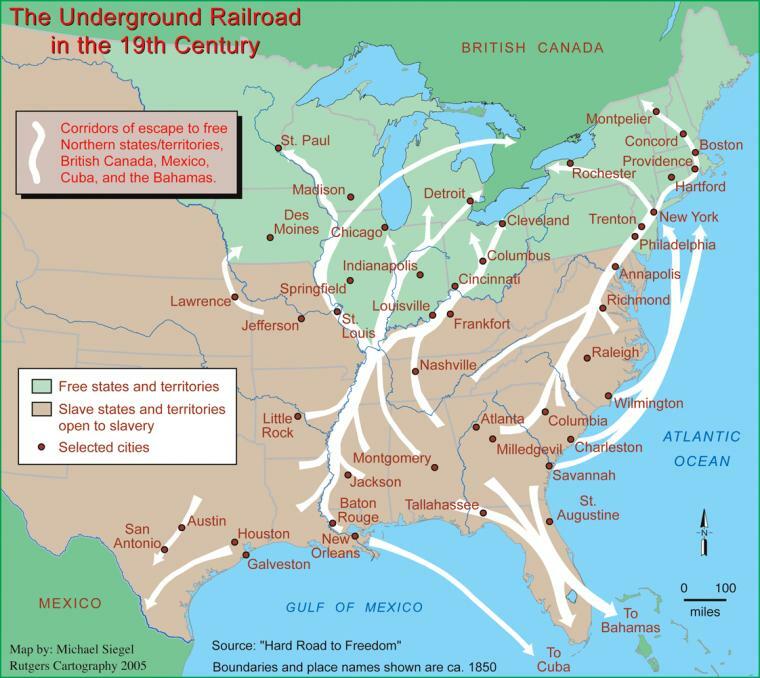 The Underground Railroad worked as a series of networks. The journey north was an extremely long route and the Underground Railroad provided depots or safe houses along the way. Those that led the runaway slaves north did so in stages. No conductor knew the entire route; he or she was responsible for the short routes from station to station. Once the “cargo” reached another station, it would be passed on to the next conductor until the entire route was traversed. This limited knowledge protected both the fugitive slaves and the integrity of the routes which sometimes extended over 1,000 miles. The success of the Underground Railroad generated much animosity among slaveholders and their allies. Because previous measures had failed to disrupt the this system of slave escape, Congress passed the Fugitive Slave Act of 1850 which allowed slave owners, or their agents to call on Federal, state and local law enforcement officials in non-slaveholding states to assist in capturing fugitive slaves. The law was greatly abused. Slave-catchers started abducting free-born African Americans. Since African Americans could not testify or have a jury present at trial they usually could not defend themselves. The slave-catcher need only to swear an oath that the black man was in fact a runaway slave and they could then return the slave to its ‘owner’ for a reward. Ironically the Fugitive Slave Act increased Northern opposition to slavery and helped hasten the Civil War. The Underground Railroad gave freedom to thousands of enslaved women and men and hope to tens of thousands more. Those who escaped became human witnesses to the slave system with many of them going on the lecture circuit to explain to Northerners the horrors of the servile institution. Others became members and supporters of the Underground Railroad. In both cases the success of the Underground Railroad hastened the destruction of slavery.